If you follow South Dakota Corn on Facebook and Twitter, you most likely notice a bit of banter about ethanol, America’s renewable, clean-burning alternative to gasoline. So why should you choose ethanol when filling up your vehicle? We’re glad you asked. Below are five reasons to choose American-made ethanol the next time you fill up. 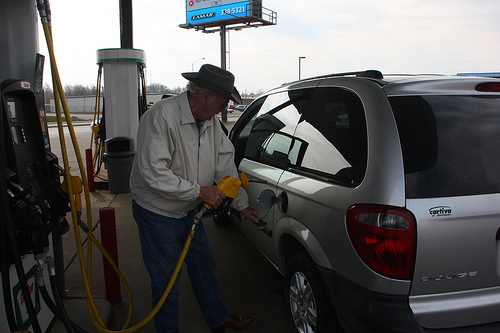 Ethanol offers drivers, especially in the Midwest, the opportunity to save money at the pump. While your overall miles/gallon will decrease slightly, most drivers see a savings when calculating their overall cost/mile with ethanol blends. And a study from Iowa State University and the University of Wisconsin shows that ethanol’s presence in the marketplace saves consumers $1.69/gallon. You can drastically reduce harmful and toxic tailpipe emissions by choosing ethanol fuel. According to the EPA, ethanol reduces greenhouse gas emissions by 52% when compared to regular gasoline. Ethanol usage eliminated 38 million metric tons of greenhouse gases in 2013, the equivalent to taking 7.9 million cars and trucks off of the road. Purchasing ethanol means you are buying local. Corn grown by area family farmers is delivered to the nearby ethanol plant where it is then manufactured into ethanol, distillers grain (high-protein livestock feed) and corn oil. The ethanol is then sold at neighborhood fuel retail station and the distillers grain is sold to livestock producers. Ethanol has an annual economic impact of $3.8 billion in South Dakota. If you live in eastern South Dakota, there’s a good chance that you are either related to or know someone who works in the ethanol industry. The industry employs 1,900 people in South Dakota with an average salary of around $60,000. In the United States, the industry employs nearly 400,000 hard-working individuals. Every time you fill up with ethanol, you are reducing the country’s dangerous dependence on imported, finite, fossil fuels, much of which come from countries that don’t share American values. In 2013, ethanol displaced the need for 476 million barrels of imported oil, using less than 3% of the world’s grains supply to do so. Ethanol saves drivers money, is renewable, American-made, cleaner burning and a major economy booster; grown by us, for us. What other reasons do you need? This entry was posted in News and tagged corn, ethanol, jobs, South Dakota.